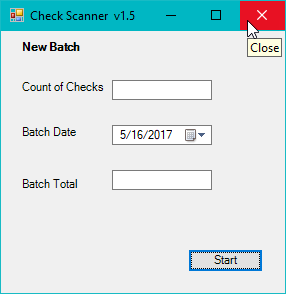 The Check Scan option is a utility that allows you to scan a batch of checks, save them to a file, and then import that file into Arena. Before the Check Scan option can be used, the scanner driver must be installed. See the Installing your Scanner page for instructions on installing a scanner driver. After the Canon scanner has been installed and the scanner is plugged in and connected to your PC, follow the steps below to use the Check Scan application. The Check Scan application must be run from an Internet Explorer browser the first time. 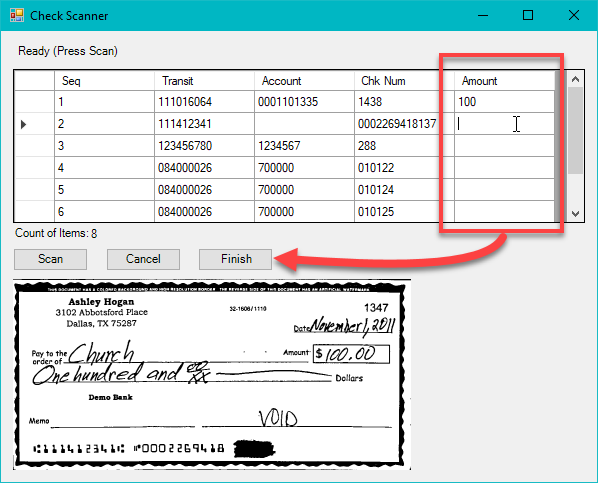 After it is run the first time, a desktop shortcut can be used to access the Check Scan application. 1. 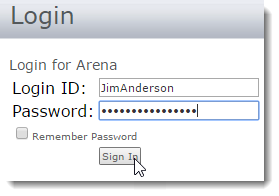 Log into your Arena site from Internet Explorer. 2. 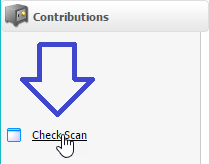 From the Contributions menu, select the Check Scan option. 3. 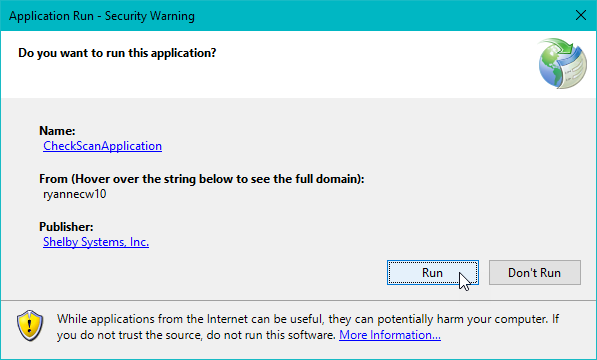 Select the Run button on the Security Warning window that appears. 4. 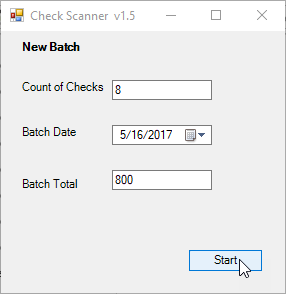 Enter the total number of total checks in the Count of Checks field, the Batch Date, and the Batch Total (The total amount of all checks) and then click the Start button. 5. When the Check Scanner window appears, place the checks into the scanner and then click the Scan button to start the scanning process. 6. After the checks have been scanned, they appear on the Check Scanner window. Enter the Amount for each check and then click the Finish button. 7. You are then prompted to save your batch as and XML file. Click the Yes button. 8. 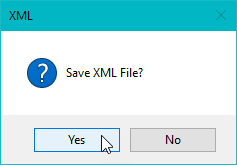 Next, a dialog box appears which allows you to rename and save the XML file in a location of your choosing. Click the Save button after you have renamed the file and selected an appropriate location to save the file. 1. 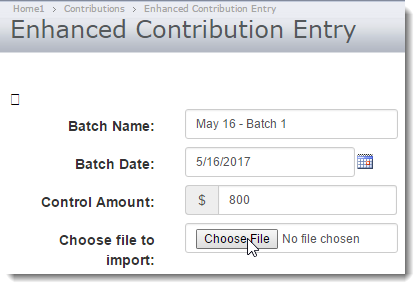 From the Contributions menu, select the Enhanced Contribution Entry option. 2. 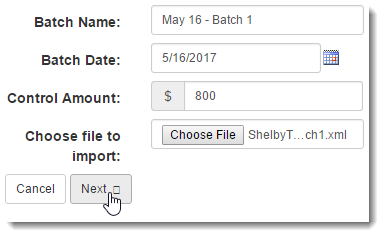 Next, enter the Batch Name, Date, and Control Amount and then click the Choose File button. 3. Locate the XML batch file using the dialog box and then click the Open button. 4. Next, click the Next button. 5. 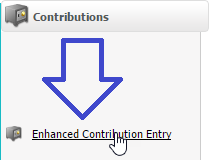 The Enhanced Contribution Entry page appears. 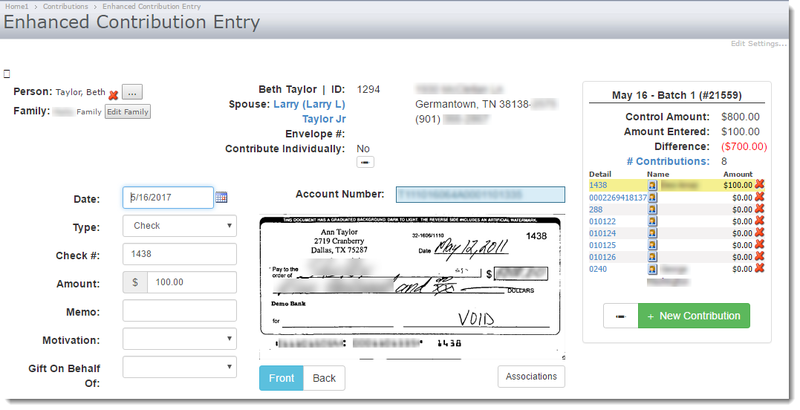 Notice that scanned checks are visible on the entry page. Enter the details for the contribution and continue entering the batch until all contributions are recorded. See the Enhanced Contribution Entry page for assistance on entering your contributions.